Sometimes the best meals come out of simply running out of food in the house – LOL. 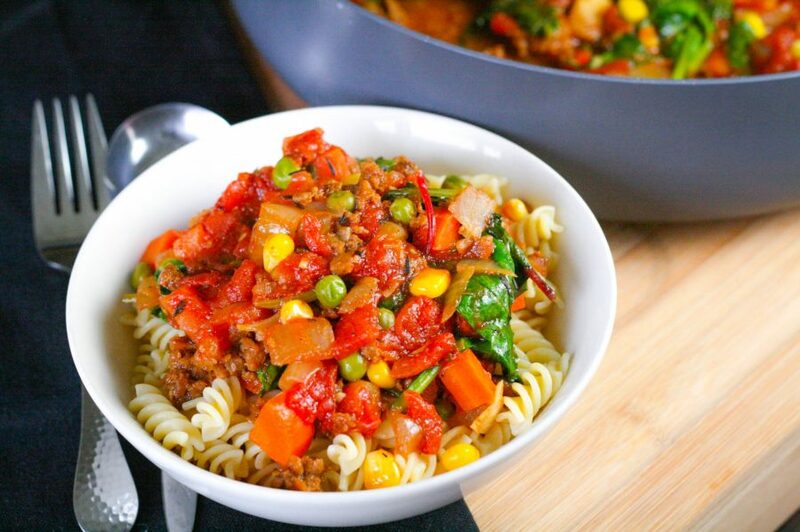 Last week I had odds and ends of a bunch of veggies left, some frozen veggie ground from Big Mountain Foods , a big can of diced tomatoes and some gluten-free fusilli. 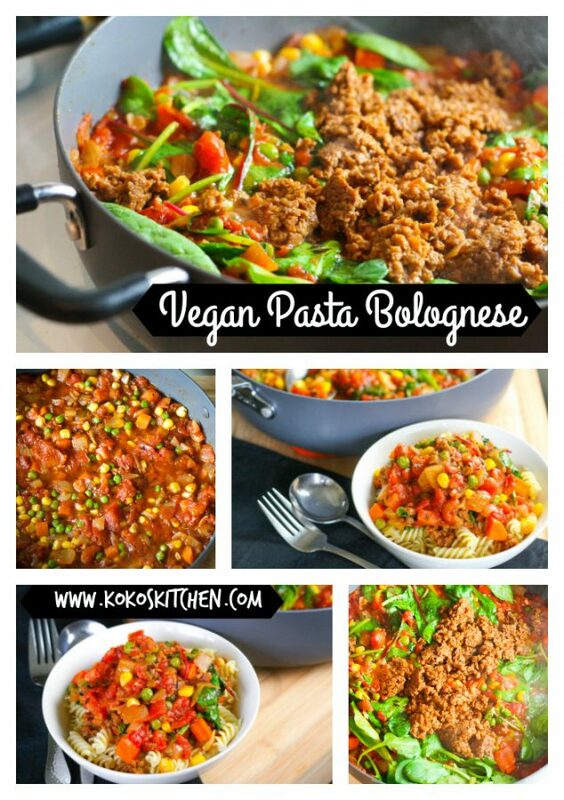 Pasta night it was, and it turned out to be the yummiest vegan bolognese pasta ever! Chock full of healthy veggies, protein-packed thanks to the veggie ground and even gluten-free. Homemade pasta sauce is so easy to make and I can’t express how much better it is than store bought. Saute some veggies together add some tomatoes, stock and herbs and just let it do it’s thing, simmering away until you’re ready to eat. Use whatever veggies you have on hand and if you don’t have fresh thyme, use dried or try another herb. 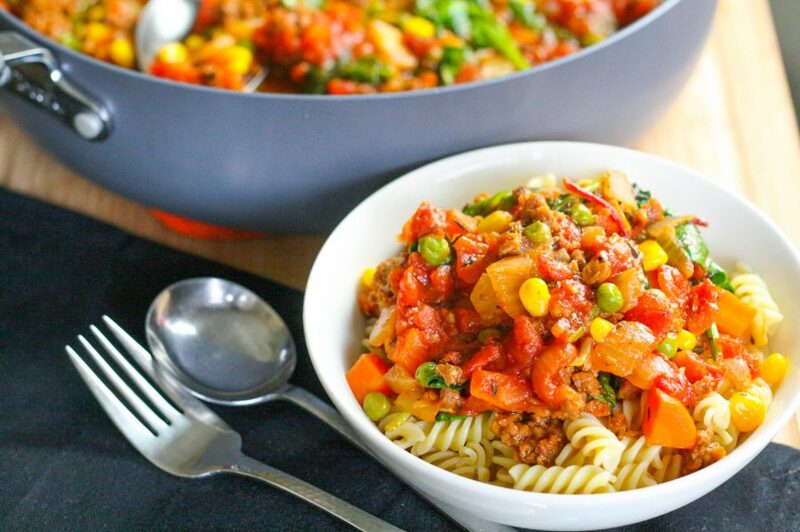 This vegan pasta bolognese is a rustic dish and not everything needs to be exact. I am a big fan of the Veggie Ground from Big Mountain Foods because it is actually cauliflower-based and doesn’t contain TVP (textured vegetable protein) or lots of wheat or soy based ingredients. It’s a more natural, wholesome choice in my opinion. 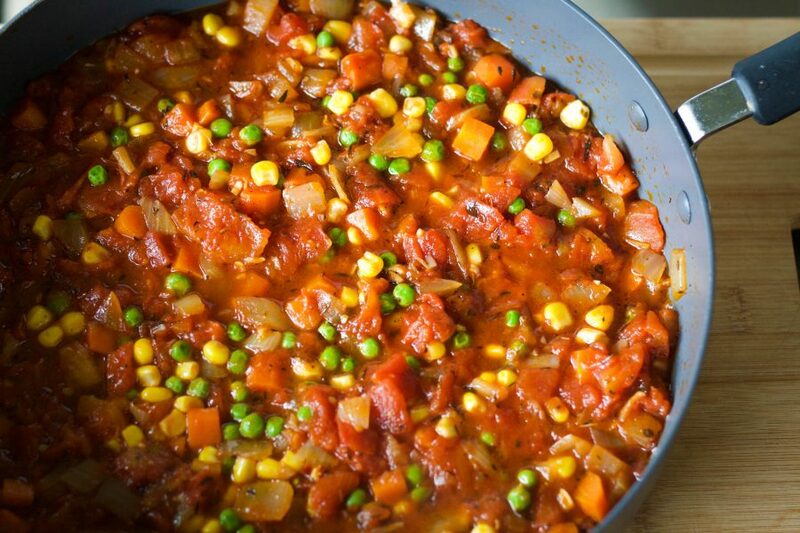 Having said that, I have tried this recipe with Yves Veggie Ground when my local grocery store ran out of Big Mountain Foods (great to see this product doing well but also grrr!) and it worked very nicely. It is based out of textured vegetable protein, though. 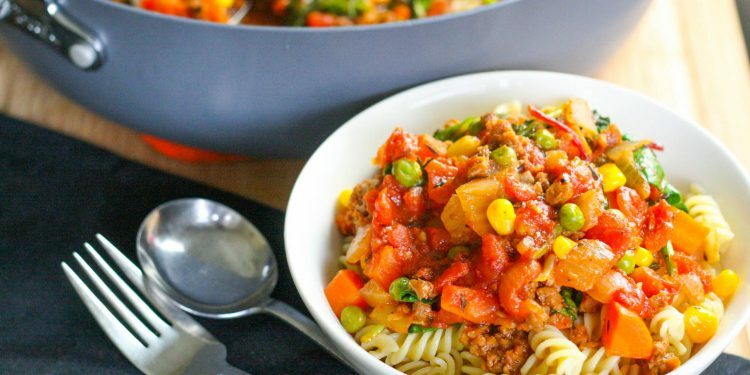 A recipe for a protein and veggie-packed bolognese without any meat or dairy. Use whatever veggies you have on hand and don't get overly concerned with quantities. This is a simple, rustic and delicious dish. 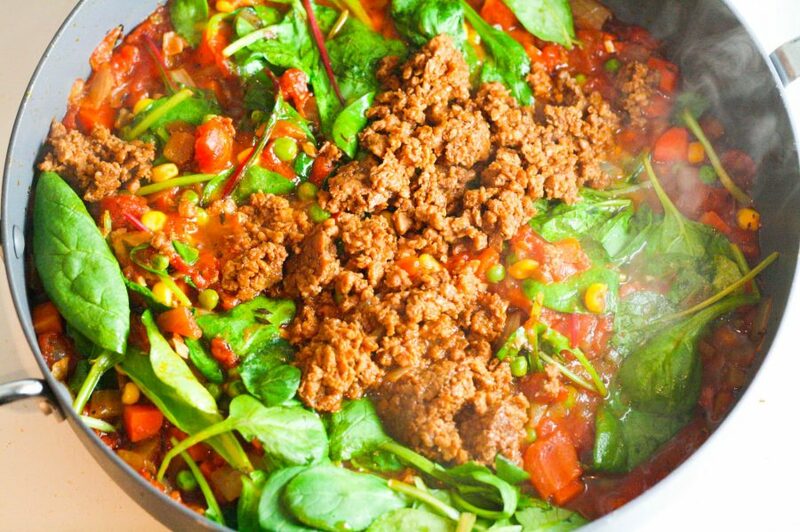 1 package of your favourite veggie ground make sure it's cooked! In a large saucepan over medium heat, add the olive oil, onions and carrot. Sweat the onions and carrot for a couple minutes until onions are translucent. Add the minced garlic, bell pepper and crushed red pepper flakes. Cooking, stirring occasionally for a couple minutes. Add the fresh thyme leaves, salt, pepper, tomato paste and coconut sugar. Cook, stirring for about two minutes. Add the red wine and stir, being sure to scrape up all the flavour from the bottom of the pan. Add the vegetable stock and diced tomatoes and bring the mixture just to a boil. Reduce heat immediately to a simmer and let the sauce simmer for at least half an hour until flavours have melded and sauce is rich and thickened. 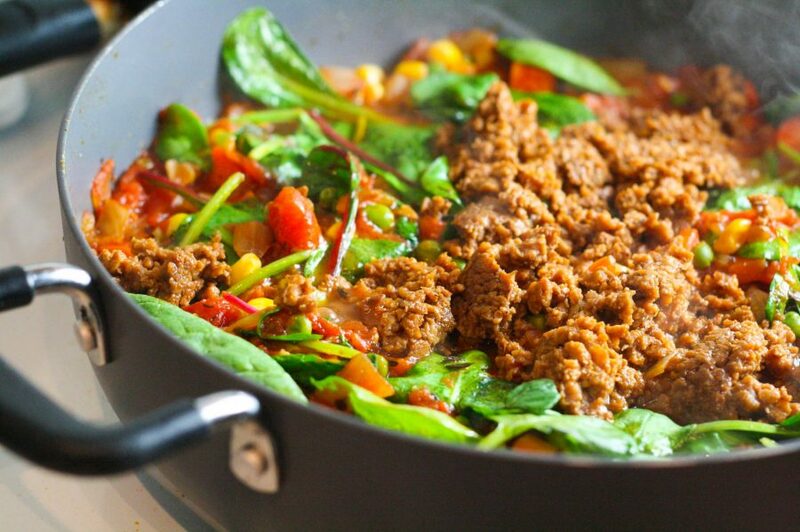 Just before serving, add the frozen corn, peas, fresh spinach and veggie mince of your choice. Stir together until evenly distributed and spinach has wilted. When the sauce is almost ready, prepare your pasta according to package directions. *Use whatever red wine you have on a hand- I like to use a 1/4 cup or so. If you don't have any (get it together!) you can add a tablespoon of red wine vinegar. **There are amazing gluten-free pastas on the market now if you need to eat gluten-free. I actually used gluten-free fusilli in this particular case. ***I like to reserve about a cup of the starchy pasta water and add it to the finished pasta and pasta sauce mixture. 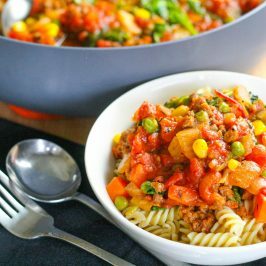 It helps the sauce stick to the pasta and binds them together in a LOVELY UNION OF PASTA AND BOLOGNESE THAT WILL BRING A TEAR TO YOUR EYE!